Another popular fish dish from the state of Kedah, but not so well known out of state. I think most of us are familiar with fish stuffed with chilli sambal. This could be something new to you. 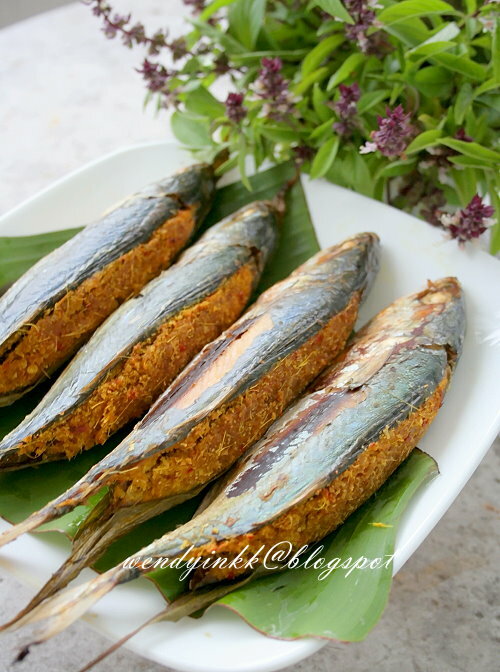 Bantut ikan literally translates as Stunted Fish. I wonder why? Is it because of after filling the fish, the fish looks fat and short? hehehe. I don't know, just guessing. I saw this being sold at the Ramadan Bazaar near my place, and I asked the man whether this is Bantut ikan. He is actually a Chinese Muslim who married a Malay wife, so he may not be familiar with the food. He just reluctantly told me in Cantonese, it's grilled fish （烧鱼） la, can go with so many names, but it's grilled fish. I bought one and went home to try, not sure if it's Bantut ikan. It was made with torpedo scad (cencaru 硬尾鳍). The filling was white, fiery, peppery, not spiced.. Hmmm.. maybe Perak's version is different than Kedah as most of Kedah's version that I've seen is yellow with turmeric. For this dish, the norm is to use snakehead (haruan 生鱼) and large snakeheads. But nowadays with the dwindling amount of fish in the rice fields, people have started to use other fishes. You can use torpedo scad (see here), indian mackerel (kembung) or even black pomfret (see the version here). Some choose to remove the back bone of the fish, some don't. The ingredients used varies with recipes but the general idea remains the same, as in "grilled fish stuffed with spiced coconut". Some wrap with leaves to grill, some go bare. So, it's up to you. I tried wrapping with leaves but I found the coconut smelling not that good, so I removed the leaves, and then, yeah, the fragrance is much much better. 1. Prepare paste. 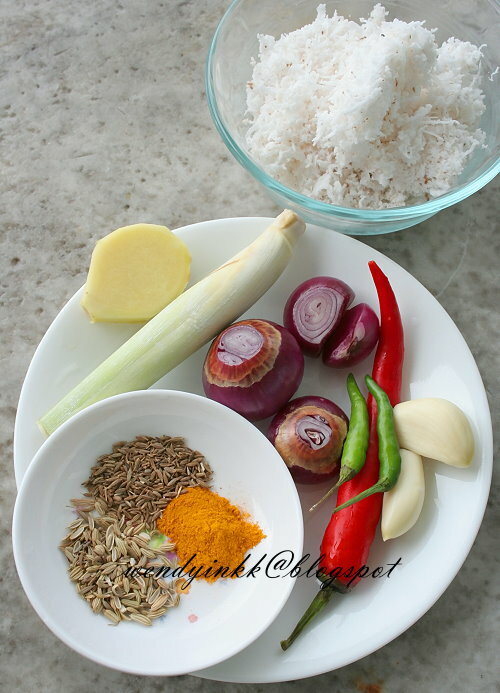 Mix paste with turmeric powder, salt and grated coconut. 2. Sprinkle some salt over fish and rub. Stuff the fish with the coconut filling. Rub some oil over fish skin. Preparation is not much. Furthermore cook with oven. Not much cleaning. I like this! 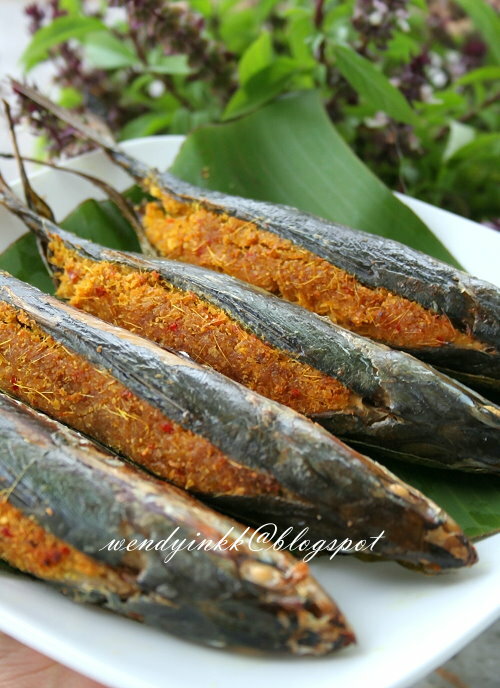 So there's more types of ikan sumbat..heehheee..this looks delicious,Wendy. This dish looks so nice! I like the coconut stuffing! the stuffing is so neat!kinda of special with coconut.. 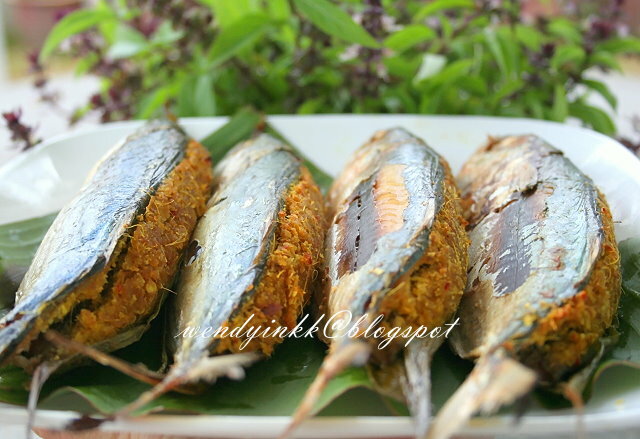 Your ikan really lives up to its name, bantut it is! You manage to stuff it so neatly to the brim! This is interesting...and your stuffing is so compact and neat! Thanks for the recipe, it is delicious. It is my first time eating bantut ikan, decided to give it a try as it looks simple to prepare yet impressive in presentation. Btw, I also love your butter cake recipe and QQ balls recipe, they always satisfy my dessert fix and will remain in my dessert repertoire for decades to come. Hope to discover more interesting recipes from your blog.